I read a good study yesterday on meal replacements. It was a meta-analysis of numerous studies using meal replacements to lose weight. The issue of meal replacements (e.g. shakes, or pre-packed calorie controlled meals) sparks many an argument in health & fitness world. As you will know of me by now I am a result-ist… if it helps you on your way to getting results and we both have a long term focus in our planning I am open to most strategies. I had a client once who had lost 10 stone (280 lbs – 127Kg) using shakes. The study looked at the results of other studies that from between one to all of the days food being provided by replacement meal options. The study had a couple of issues, the meta analysis had a really wide range of studies to use which makes comparison difficult, e.g. there is a big difference between having one meal replacement shake say for lunch vs having no “normal” meals because you are on an all shake diet. Another problem with funded studies on weight loss replacements shakes is they are usually paid for by companies that sell the products. This study showed that adding in meal replacements instead of a meal at least once per day had an effect of helping people lose ~1.5Kg more than those who didn’t have it (trying to lose weight by healthy diet only). These results held at the one year mark after the study began. To me what was more interesting was that it looked at the benefits of support on results both using a meal replacement and without. The result showed the power of having a helping hand. With support participants lost an extra ~2 Kg on top of the results from using a meal replacement. The non meal replacement group lost an extra 1.5 Kg from having access to support. The results basically show two things, having a very simple meal (be it a shake or pre prepared meal) means people eat less overall by having it than if they didn’t. This suggests that a fixed calorie portion meal is more likely to be smaller in size than being free to choose whatever you want to eat for all your meals in a day when trying to lose fat. It could also be that the content of the meal replacements (e.g. higher protein perhaps) means you eat less during a day when you have them than when you do not. The second thing it showed was people do much better when getting support and coaching while trying to lose weight. When reporting to someone, being able to discuss problems and troubleshoot their problems participants lost more fat. This is hardly the first study to show this which I have written about previously. As someone who works in the trade of helping people get in shape I still find it baffling how few people seek help when trying to get in shape. The results rates of fat loss are beyond awful with very few people going on to maintain results. If support adds to your successes then it is only common sense to use it. I was discussing yesterday with a new client how weight loss is the hardest goal because it is so woven into all parts of your life. The behaviours that affect getting in shape link into your social life, they are influenced by stress levels. your hobbies, your energy levels and more. The other problem is that your goal only really affects you, if you decide to stop going to work you will cause problems, let others down and start a cascade of events that will bring consequences to you. If you do not go to the gym this week, or eat too much food today, no one will say anything and probably no one would even notice. The flip side to this though is your health & fitness goals have no actual blocks stopping you succeeding. At work it will not be you who decides who gets the promotion so success is not completely in your hands. With body change, everything is under your control even if the goal is woven into other areas of your life. No one can actually force you to eat if you do not want to or you can exercise even if tired etc. Through having support it adds some importance to your goal, it adds accountability in a good way and means there are consequences if you do not act. It is also very difficult to coach yourself in any field where there is confusing inputs. Health & Fitness has more confusion and contradiction than any other area I know. This means you can easily begin to doubt the plan and become inconsistent when not being given support. My advice to anyone getting in shape is fairly simple, focus on five year goal outcomes (e.g. who would you need to be to attain and then maintain in five years time) and get some people in some form around you to help in this process. 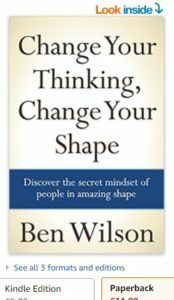 Photo – My Book – Change Your Thinking – Change Your Shape – I discuss support and the influence of other people. Buy Here (UK) or Here (USA).